Liam has the Redwall bug. He’s whipping through the series like a hurricane. His older brother had the same reaction to the Redwall series. I cooperated with the addiction by reading two of the books aloud to the entire family. Yes, they’re delightful in their own way and Brian Jacques has to be commended for creating clever dialects, delightful animal characterizations and repeatedly stimulating battles that keep kids on the edge of their seats. Uh, Simon will be mean to a girl from South Dakota? Now honestly, I love the series. I love the way it engages readers, infects them with the drive to read hundreds of pages. More than anything though, I thank Brian Jacques for making my kids’ mouths salivate with a desire for dandelion cordial and meadowcream because those cravings drove us to purchase the Redwall Cookbook last week. Unlike the fictional series, I’ve combed every page for meal time inspiration. Liam and I were immediately drawn to the recipe for Nunnymollers. We sifted the flour and confectioner’s sugar together while cutting in the crumbled butter. We palmed the mixture into small balls of dough which we then flattened into five inch discs. We spread a thin layer of honey across each one, dotting the tops with three fresh raspberries each. 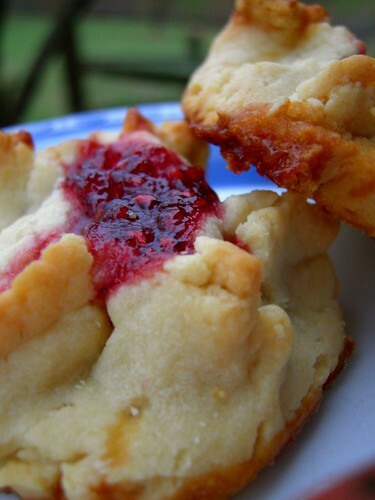 Finally, Liam and I pinched the sides up into little purses and topped them with dollops of raspberry jam. Into the oven they went. 30 minutes later we had teatime ala Redwall. My mind didn’t wander. Neither did my tongue… or my hips which now proudly sport the effects of white flour, sugar and butter. New Year’s weight loss resolutions be damned. I snarfed down four of those suckers. Oh. My. Deliciousness. They are sooooo good. 1. Preheat oven to 350. Whisk flour and sugar together. Add butter and rub it in with your fingers (or pulse in food processor) until mixture resembles fine bread crumbs. Sprinkle 3-4 tablespoons of ice cold water, mixing with fork or pulsing in food processor. 2. Divide dough into twelve 2-inch balls. Use your palm or rolling pin to flatten each ball into a 5-inch round. 3. Spread each round with a thin layer of honey. Place 1 strawberry and 1 raspberry in the center. (We used three raspberries and no strawberries in ours.) Fold edges of dough “in” toward the center, leaving a small opening in the middle. Pinch folds. Put a dollop of jam on top. 4. Bake until firm and golden, about 20-25 minutes. Let cool on wire rack before serving. By the way, I need more teatime photos from your houses! Send them to me: Julie [at] bravewriter [dot] com. I’ll post them on Tuesdays. They are often the favorite posts of the week. For your trouble, we send a complimentary issue of the Arrow or Boomerang. « What’s love got to do with it? Your Nunnymollers look just like Hamentashen, the cookies that Jewish people eat on Purim in the spring! Yum, yum. Colleen, Ha! Too fun to have you identify. 🙂 Cookbook is darling and the food is yummy. The Redwall series is one that never did interest any of my children, ….. and I really did try to get them interested. I started reading them at two different times and finished the first book. I ended up giving them away to my cousin’s son. Hi, Julie…you really should look up some of the full-cast recordings – they are very well done and can relieve the eye- or throat-strain of reading all those pages. At the official Redwall site from England they are offering a cute compendium of about 20 original songs that are contained within the different story CDs. The Redwall songs made their way into a certain girl’s stocking this past Christmas and have been much listened to and sung since then! Linda, that sounds great! Thanks for the suggestion. I wanted to share my nunnymollers experience. I made them yesterday as dessert for my sister’s baby shower. My own sweet children were less than thrilled that these delicious looking goodies were not for our family’s consumption. At the shower, it was quite amusing as the guests asked me what the yummies were called. I told them, “Nunnymollers.” A questioning look arose. “Have you heard of Brian Jacques?” I asked? Blank stares. “Oh…cool.” And we proceeded to devour the nunnymollers. Back at home, my own kids were THRILLED to learn that I had leftovers and was able to bring home a cookie for each child. I don’t think I’ve ever experienced such verbal delight as they each savored their nunnymoller. Truly, the “Oohhhhs” and “ummmms” were hilarious. In short, thanks for sharing! I’m sure we’ll be repeating this recipe for teatime in the not too distant future!